German designer, Philippe Plein, has made a bold move by choosing once, twice, three times a party girl, Lindsay Lohan, to front his new campaign. Philippe Plein is known for his bold designs, and we at Tell Us Fashion wonder whether Lindsay Lohan has the right balance of good girl gone bad, mixed with high fashion, or question whether the former Disney Princess who raced around in magical cars has lost her sparkle and all fashion credentials. Lindsay is no stranger to the fashion game herself, having featured in Vogue numerous times, and modelling her own clothing line, 6126. Only Ms Lohan could dodge a lengthy jail sentence and land a dream modelling campaign; let’s just hope the end shots of Plein’s campaign aren’t guilty of comitting crimes against fashion. The nights are drawing in, the sun has taken his hat off and you find yourself dodging soggy leaves on your way to work; Autumn is well and truly knocking at our door. So why not welcome it in, treat it to a cuppa and embrace the best season for fashion; covering up has never been so much fun. 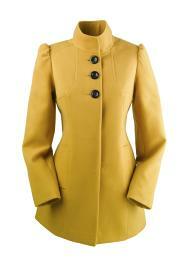 Strong to smell and fierce on the eye, mustard is a must have for any girls wardrobe this season. From coats to bags and shirt to shoes; this vibrant shade livens up any outfit, leaving you looking and feeling as fresh as an Autumnal morning. 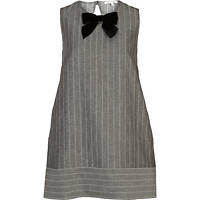 During a last ditch attempt to bag some holiday bargains, I saw an abundance of shift dresses across all of the high street stores. Perfect paired with tights and patent shoes for work, or you can dare to bare and lose the hosiery for a night on the town. We at Tellusfashion have caught a late Summer Cole Cold, and the only cure seems to be seeing a lovely picture of Mrs C showing us how shift dresses are meant to be worn, take is away Chezza. If you’re anything like us then the last of your wages would have gone on that delicious Friday afternoon Starbucks binge, so this Alexander McQueen dress will have to wait until next month. However, this stunning Cheryl-esque shift dress from River Island won’t break the bank, and is perfect for those Saturday pre night out X Factor party evenings . Queen B gave us a glimpse of things to come when she hit Glastonbury like a dancing disco ball; shimmy-ing her way in to the fashion elite and making us feel like Christmas had come early. Razzle dazzle them all the way up to Christmas with this gorgeous FCUK sequin Samantha dress, as seen on Coronation Street cutie Brooke Kinsella. If I were a boy, even just for a day, I would raid that fella’s wardrobe and steal his clothes in my own way. The tuxedo and tailored look hit the red carpet earlier this year and sees no sign of stopping, which means us ladies can save our money and go all Gok Wan on our boyfriends favourite suit. Head to ASOS.com for some tailored inspiration; from plain and simple, to keeping in with the colour blocking trend, they have it all. These statement pieces will help create that capsule Autumn wardrobe, and help to ease the pain of the colder days to come. This weekend I donned my wellies, piled my hair on top of my head and spent a good 20 minutes erecting a seemingly simple pop up tent; that’s right, V Festival was upon us. Mud and drinking alcohol at 8am in the morning aren’t the only things that pop out at V, as the fashion is always forward and celebs would fool us in to thinking that they just threw something on, ready for the messy day ahead. So while I donned my slouchy vest, hareem trousers, plimsols and hat, the likes of Jessie J and Ellie Goulding displayed their fringe benefits, a trend which seems to boomarang back around the fashion world each season. I saw many girls adopting this style, from fringed boots to bags, and admired some very funky fringed crop tops being sold at the infamous V stalls. Unfortunately, during a lot of heavy jumping around to The Wanted, my camera (full of pictures of V fashionistas) became as free as my body and was never to be seen again during the weekend; but for a glimpse of Max you have to give up a few things. The biggest trend at this years V had to be ultra short shorts; something which Rihanna pulled off at both the Chelmsford and Stafford sites. I witnessed Ri-Ri getting R-rated in her cropped denim shorts and Union Jack crop top; an outfit which screamed sexuality but I expected nothing less from her. Gone was the side show Bob bright red hair, which was pleasantly replaced with a bouncing mane full of caramel huws. If you’re anything like me and had been hitting the burger and noodle vans all weekend, then covering up that midriff might be the better option. 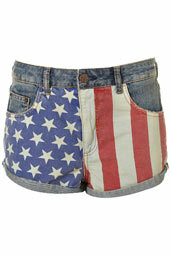 That’s why this Union Jack body from Religion is ideal for those chunky days; stylish yet comfortable. Toned tums were also a highlight of the weekend, with Frankie and Rochelle from The Saturdays displaying abs-olutely amazing stomachs. 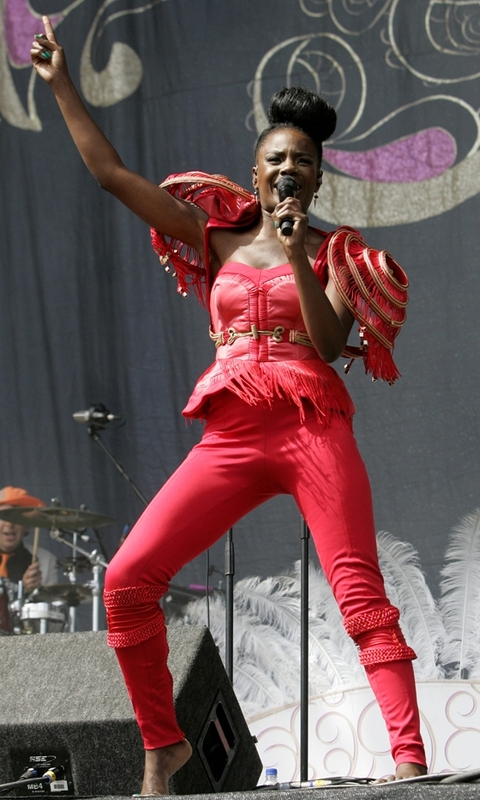 My fashion highlight; apart from my own Rihanna vest, came from The Noisettes Shingai Shoniwa, who set the 4 Music stage alite with an outfit that resembled a funky lampshade. A similar outfit can be found by one of Tellusfashions featured designers, Anam Naseer. The X Factor’s newest firecracker, Tulisa, continued her Cheryl Cole-over, donning a tight leather outfit and a leopard print dress. V festival reminded me of a fashion show; mental, messy and a bit of a blur. My cherry has been popped and I look forward to attending more next year, with my shortest shorts, cropped top and maybe even some fishnets. 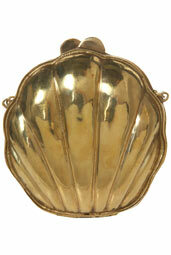 I’m off to recover in my California King Bed. 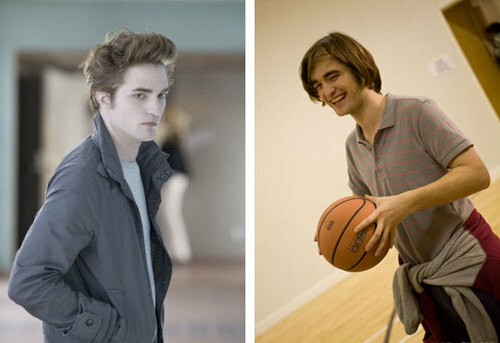 Robert Pattinson is known for three things. 1. His brute rugged manliness and ability to have women swooning in roughly 5 seconds. 2. His pretty impressive acting prowess. 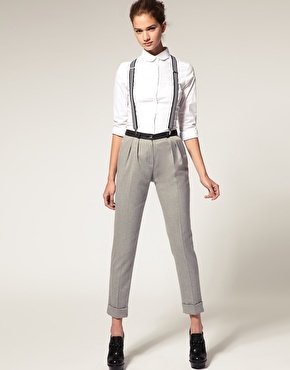 and 3. his ability to turn geek into chic. He has also turned his hand to singing, and can not only hold a good note, but also play a guitar while doing so; but can this brooding Brit turned Hollywood hottie make magic happen in the fashion world by releasing his own range of clothes? One glimpse at this picture and yes he can…. It comes after fellow Twilight star, Kellan Lutz, launched his own label this week and let slip that R-Patz would love to put needle to thread and release his own line of clothing. Kellan is quoted as saying “Robert is a hipster, and perhaps he could call it ‘Rags By Rob.’ Tellusfashion isn’t sold on the name, but the idea could be very successful, as everything Robert does turns to gold. So in celebration of this potentially enchanting fashion prospect tellusfashion takes a look at the darker Twilight inspired outfits, which fall in perfectly for the looming Autumn season; step back Bella, this runway belongs to us. Raid the deepest depths of your wardrobe and pull put those dark items; Autum is upon us and it’s time to come out and play. Katie wears a tracksuit from her Day 22 fashion range; an idea bought to life by Ms Price and British fashion designer Lamis Khamis. By taking a quick look through Katie’s collection, it is evident she needed the backing of an established designer to give her label an added push, and perhaps distract from the fact that it isn’t too easy on our eyes; the words market stall spring to mind, yet the price reflects a more up market persona. Tellusfashion believes these pieces speak for themselves, and we embrace all sorts of styles, but there is nothing stand out about the garments; they almost have a feel of an Ebay shop that you could of set up yourself. This week The Pricey took to the run way to debut her new garms, but typically chose to don a garish leopard print dress and leave the chav chic to the poor old models. Katie’s range is typical ‘Pricey’; loud, expensive and cheap to look at. The collection is promoted as items you would wear again and again, but for tellusfashion that would have to be on our laundry day when even the dressing gown won’t do. We never underestimated the Pricey; her collection is everything we imagined it would be. 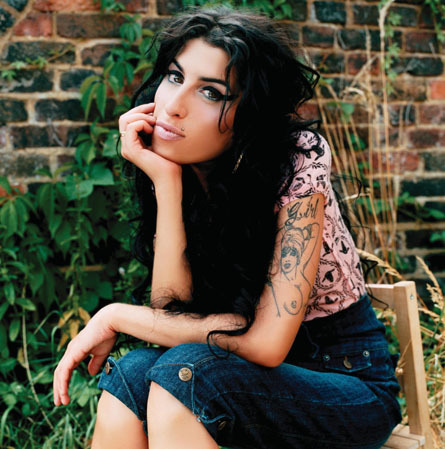 This weekend the world was rocked by the news of Amy Winehouse’s tragic death, aged only 27. Many will be reading numerous posts on blog sites, just like this one. As a journalist I write about what is happening in the here and now; many have been quick to say “but if she were still alive you wouldn’t be honouring her style.” Granted, this is true, but I would rather write this than be badgering her over problems, which were out of her control, as that was well documented and scrutinized already. We live in the here and now; this is happening now. Here at Tellusfashion, we want to celebrate the life of an extremely gifted individual; she may have been troubled but there’s no denying her talent, heart and that voice. From beehives to black eyeliner, Amy put her own mark on the fashion industry and refused to go to fashion rehab. This is our small, but poignant, celebration of some of Amy’s style yes’s and also the no no no’s. Amy didn’t just go back to black on her album, but also with her fashion choices. Above she is seen wearing a Fred Perry playsuit from her own collection. Here is she pictured looking elegant at The Elle Style Awards, but still keeping her signature style with her back combed beehive and striking black eyeliner. Girly and glam aren’t two words usually associated with Ms Winehouse, but the above pictures put the Hollywood Elite to shame. We particularly like the bright yellow dress teamed with the gorgeous red heart patent bag. 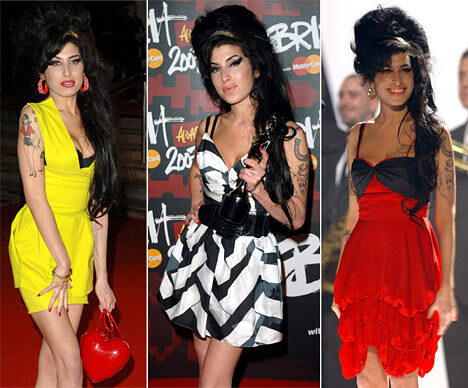 Amy’s style was 50’s with a Camden edge, and it showed in everything she wore. This picture shows Amy at her fashion finest, working the leopard print, letting her hair down in oh so cool waves and keeping it real with that eye make up, which everyone has tried to recreate atleast once; go on admit it… it’s ok.
Of course Amy wasn’t always pictured looking her finest, but that just makes us love her all the more, and if anything, actually see what she was going through. Who would be dressed up to the nines when they are battling an addiction? In the Autumn of 2010, Amy collaborated with Fred Perry; bringing her unique style together with a label she loved, and that happiness can be seen in the below pictures. Amy was quoted as saying, about the collaboration “if I died tomorrow, I would be a very happy girl” and according to reports Amy has designed all the way up to 2012, and we cannot wait to see what else she has up her talented tattooed sleeve. 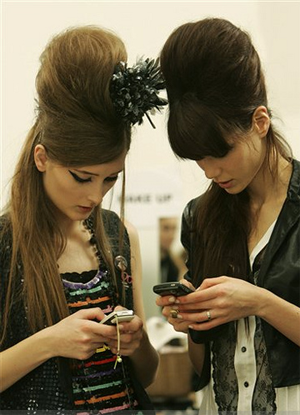 Amy influenced the world of fashion more than many realise, with legendary deigner Karl Lagerfield using her as his ‘muse’, and even styling his models for the 2007 Chanel show based on her look. Even gorgeous super model Adriana Lima donned the Winehouse get up for a Vogue photoshoot. If you fancy taking a piece of Amy’s style with you on a night out, but aren’t feeling too daring, then why not pop on this gorgeous lipsy cocktail dress, £60, www.lipsy.co.uk, team it with some killer River Island heels, £85 www.riverisland.com, and a lush Topshop statement clutch £35.